Background: Fear of a dental child is most commonly associated with dentist attire and usage of syringe. 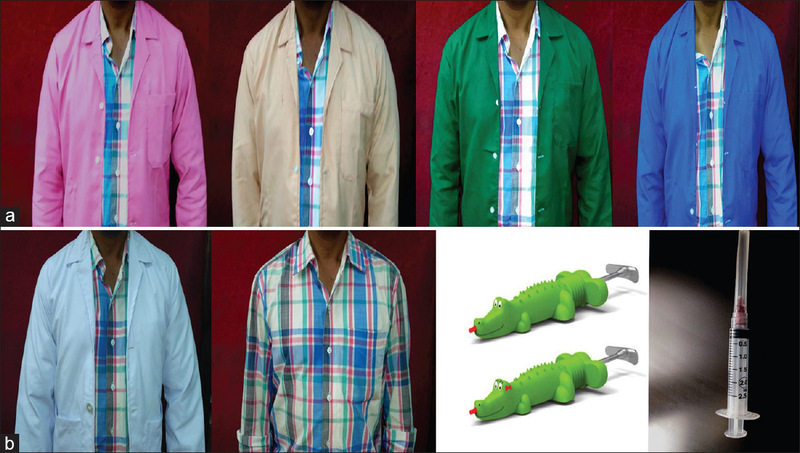 The objective of the study was to evaluate the preference of dentist's attire and kind of syringe (conventional or camouflage) among different age groups of children. Materials and Methods: In this cross-sectional study A total of 750 children aged 4–14 years were included in the study. All the participants were subdivided into five major groups according to their age, i.e., 4–5 years, 6–7 years, 8–9 years, 10–11 years, and 12–14 years. A set of six photographs which included dentists in white-colored apron, pink-colored apron, green-colored apron, blue-colored apron, and gown with cartoon character and dentists without apron (formal attire) along with: (a) camouflage syringe and (b) conventional syringe were provided to every child and was asked to give his/her preference looking at the six set of pictures. The preference of each child was thus recorded. Children's anxiety level during injections and dentist attire was assessed and recorded using two anxiety scales, i.e. the Modified Child Dental Anxiety Scale faces version and Facial Image Scale.SPSS statistical software and Chi-square test were used. (P < 0.05). Results: A majority of 35.3% participants in the 4–5-years age group preferred aprons with cartoon character, while 65.3% in the 12–14-years age group selected white apron as the preferred choice. Regarding preference of the syringe type, it was observed that 82% of the younger age preferred camouflage syringe and 75% of the older age preferred conventional syringe. On comparison of both the scales, no significant differences were found. About 82% children in the older age group were reported to be nonanxious with white attire and only 14% were anxious with the conventional syringe type. Conclusion: Younger children have a greater preference of colorful attire of dentist and camouflage syringe over the conventional one when compared to older children. In pediatric practice, the success of the dentist to deliver good-quality work not only depends on the best methods and techniques applied but also on the interaction between the dentist and the child which helps in motivating and improving the working environment. In dental practice, the most common hindrance faced is the uncooperative behavior of young children who do not cooperate with dental procedures because of their fear of the dentist and the dental treatment. As a child enters a dental clinic, a doctor's first appearance is most important to develop a positive or negative impression in the child's mind. Thus, the dentist attire should be most appealing to the young patients to control their fear and anxiety about the dentist and dental treatment. Children often make judgments about their dentist based on his or her appearance. Children could link colors to various emotions such as pleasing or unpleasant one.,, Previous studies hypothesized that colors such as red, blue, yellow, green, black, and white were associated with anger, happiness, sadness, surprise, disgust, and fear, respectively. One way of motivating children is using their favorite color. The prevalence of fearful dental children ranges from 3% to 55% in various populations. It has been observed from previous studies that younger children are more anxious than older ones. The evaluation of dental anxiety in children is a concern as the unexpected behavior of these children will have an impact on the management in the clinical setting. The Modified Child Dental Anxiety Scale faces version (MCDASf) was formed by adding a cartoon faces rating scale to the original numeric form, and the Facial Image Scale (FIS) which comprises a row of five faces ranging from very happy to very unhappy (scores ranging from 1 to 5; the unhappiest face which depicted highest anxiety was assigned a score of 5 and the happiest face was assigned a score of 1). The present study was conducted with an aim to evaluate the preference of the dentist's attire and the kind of syringe (conventional or camouflage) and to evaluate the anxiety levels related to them among different age groups of children undertaken in the study. This cross-sectional study was undertaken in Jodhpur city of Rajasthan, and the study population comprised of a total of 750 school children. Institutional ethical clearance and written consent from principals of the respective schools was obtained before the start of the study. All the participants were from 4 to 14 years of age and were subdivided into five major groups according to their age, i.e., 4–5 years, 6–7 years, 8–9 years, 10–11 years, and 12–14 years. Each group comprised of 150 participants (n = 150). Out of the total sample, female population was more (398, i.e., 53.1%) as compared to the males (352, i.e., 46.9%). The child preference for the dentist attire and syringe was evaluated by asking each child to look at a set of six photographs. The six photographs included dentists in white-colored apron, pink-colored apron, green-colored apron, blue-colored apron, and gown with cartoon character and dentists without apron (formal attire) [Figure 1]a along with: (a) camouflage syringe and (b) conventional syringe [Figure 1]b. The preference of each child was thus recorded [Figure 1] and [Figure 2]. Figure 2: Image showing a child preference for dentist attire and syringe. Next, to evaluate the anxiety levels of the children of different subgroups with regard to their preference for syringe and white coat, two anxiety scales were used separately. One was FIS which comprises a row of five faces ranging from very happy to very unhappy (scores ranging from 1 to 5; the unhappiest face which depicted highest anxiety was assigned a score of 5 and the happiest face was assigned a score of 1[Figure 3]. Figure 3: Image showing MCDm/f scale. The second anxiety scale used in this study was MCDASf, which scored as follows: (1) not afraid, (2) little afraid, (3) fairly afraid, (4) quite afraid, and (5) very afraid. Total scores thus ranged from 2 to 10. Children with a score <4 were categorized as nonanxious, >4 to <6 as moderately anxious, and >6 as anxious. Using these two scales, the anxiety evaluation of each child was done regarding the preference of the dentist attire and syringe and was recorded. Results were tabulated and statistically analyzed using SPSS statistical software IBM SPSS Statistics for Windows, Version 21.0. Armonk, NY: IBM Corp and using Chi-square test for categorical variables. From the results of the present study, it was observed that a majority of 35.3% participants in the 4–5-year age group preferred aprons with cartoon character, while the least preferred choice was dentist without apron (1.3%). About 34.6% in the 6–7-year age group selected apron with cartoon character as the preferred choice, while the least preferred choice was dentist with blue apron (4.6%). Further, 42.6% in the in 8–9-year age group selected white apron as the preferred choice, while the least preferred choice was dentist with both blue and green aprons (2.6% each). About 61.3% in the 10–11-year age group selected white apron as the preferred choice, while the least preferred choice was dentist without aprons (4.6%). Finally, 65.3% in the 12–14-year age group selected white apron as the preferred choice, while the least preferred choice was dentist without aprons (1.3%) [Table 1]. When gender was compared among all the age groups, it was observed that among 4–5 years, 36.45% females selected pink apron, while 31.23% males selected cartoon apron. Nearly 38.23% females in the 6–7-year age group selected pink apron, while 36.45% males selected cartoon apron. About 31.25% females in the 8–9 years age group selected pink apron, while 45.26% males selected cartoon apron. About 38.13% females and 42.28% males in the 10–11-year age group selected white coat and 61.32% females and 62.54% males in the 12–14-year age group selected white coat. The results were found to be statistically significant (P < 0.05). For convenience, we divided the age groups into two broad categories, i.e. younger age group which included the age range from 4 to 9 years and the older age group which included the age range from 10 to 14 years of age. 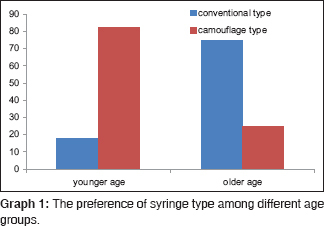 When results of preference of syringe type were observed, it was seen that 82% of the younger age preferred the camouflage syringe, while only 18% preferred the conventional type. On the contrary, 75% of the older age preferred the conventional syringe, while only 25% preferred the camouflage one. The difference was found to be statistically significant (P < 0.05) [Table 2] and [Graph 1]. When we compared the anxiety levels using both MCDASf scale and FIS for the dentist attire, it was observed that, with MCDASf scale, the younger age group reported 49.1% children to be nonanxious and 38% to be anxious with the white coat. The older age group reported 82% children to be nonanxious and only 18% to be anxious with the white coat. Using the FIS scale, the younger age group reported 51.1% children to be negative and 36% to be positive with the white coat. While the older age group reported only 16% children to be negative and 79% to be positive with the white coat [Table 3]. On comparison of both the scales, no significant differences were found (P > 0.05), and there was also no significant difference for anxiety rating scores of male and female population (P > 0.05). 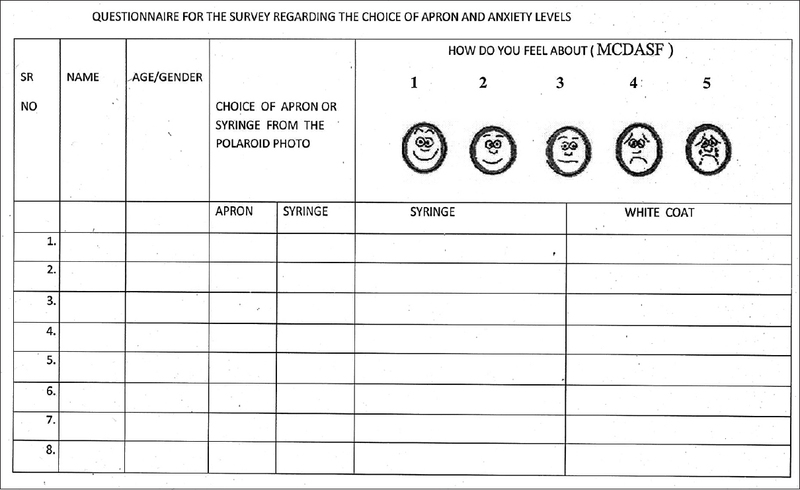 When the anxiety levels of all the children with regard to the type of syringe used were compared, using the MCDASf scale, it was observed that, in the younger age group, only 20% were nonanxious, while 46% were anxious for the conventional syringe type, while in the older age group, 72% were nonanxious while only 14% were anxious. Using the FIS scale, the younger age group reported 52% children to be negative and 38% to be positive for the conventional type. While in the older age group, only 18% children reported to be negative and 74% reported to be positive (P < 0.05) [Table 4]. The aim of this study was to observe and evaluate the children's preference and their anxiety level toward their dentist attire and the type of syringe used by the dentist. This fear of visiting a dentist and related anxiety is a major barrier in delivering the successful dental care., Children fear is more strongly associated with subjective experience of pain than objective type and fear is more among girls than boys. For successful dental care, identification and prevention of dental fear is a must. Both attitude and attire of dentist can influence the child's attitude toward dental care. Several studies have observed that color has been associated with negative or positive type of emotions in children.,, Use of a child-friendly color can create a positive environment. Similar to our results in [Graph 1], Asokan et al. observed the preference of colored attire of dentists among younger children over the older ones. AlSarheed concluded from his study that 90% children preferred dentists with white coat and 40% preferred dentists with white coat along with mask. Ikusaka et al. observed preference of white coat over casuals among older individuals. Our study results reported that the younger age group preferred colored attire and the cartoon one rather than the regular white attire. Whereas the older age group preferred the professional attire which is the white coat. Umamaheshwari et al. from their study observed that both anxious and nonanxious children preferred yellow color for positive emotion followed by blue and black or red for negative emotion and they observed high significance of color with emotion. Ikusaka et al. concluded from their questionnaire survey study that practice without white coat might reduce the patient's anxiety during the first visit. In contrast to our study, McCarthy et al. observed higher white coat preference in children. Rehman et al. also reported that older individuals prefer a professional attire. In relation to the preference for the type of syringe used, it was observed that the younger population preferred camouflage syringes as these are effective to reduce dental fear and anxiety which is more in the younger age group, whereas the older population were in favor of the conventional type of syringe. Our results are in accordance with the study conducted by Ujaoney et al. On comparison of both the scales used in the study, no significant differences were found in the results, and their results were found to be almost comparable. There was no significant difference for anxiety rating scores on male and female population. We observed a decrease in anxiety levels with regard to preference for syringe as age advances, and this is in accordance with a study by Raj et al. They also found no significant difference in fear scores between girls and boys. It has been observed from the present study that younger children prefer cartoon and colorful pediatric dentist attire and the use of camouflage syringe in younger individuals reduces the dental fear. Older children prefer white-dressed dentist. These data help in implementing quality dental care and reducing a child's dental anxiety by creating a child-friendly environment. Younger children prefer colorful attire of dentist and camouflage syringe over the conventional one. Children anxiety level decreases with age and preference for white coat and conventional syringe increases. Alsarheed M. Children's perception of their dentists. Eur J Dent 2011;5:186-90. Hemphill M. A note on adults' color-emotion associations. J Genet Psychol 1996;157:275-80. Umamaheshwari N, Asokan S, Kumaran TS. Child friendly colors in a pediatric dental practice. J Indian Soc Pedod Prev Dent 2013;31:225-8. Asokan A, Kambalimath HV, Patil RU, Maran S, Bharath KP. A survey of the dentist attire and gender preferences in dentally anxious children. J Indian Soc Pedod Prev Dent 2016;34:30-5. Vagnoli L, Caprilli S, Robiglio A, Messeri A. Clown doctors as a treatment for preoperative anxiety in children: A randomized, prospective study. Pediatrics 2005;116:e563-7. Terwogt MM, Hoeksma JB. Colors and emotions: Preferences and combinations. J Gen Psychol 1995;122:5-17. Ujaoney S, Mamtani M, Thakre T, Tote J, Hazarey V, Hazarey P, et al. Efficacy trial of camouflage syringe to reduce dental fear and anxiety. Eur J Paediatr Dent 2013;14:273-8. Gustafsson A, Arnrup K, Broberg AG, Bodin L, Berggren U. Child dental fear as measured with the dental subscale of the children's fear survey schedule: The impact of referral status and type of informant (child versus parent). Community Dent Oral Epidemiol 2010;38:256-66. Howard KE, Freeman R. Reliability and validity of a faces version of the modified child dental anxiety scale. Int J Paediatr Dent 2007;17:281-8. Howard KE. Measuring and Managing Child Dental Anxiety. Phd Thesis: Queen's University Belfast; 2006. Krishnappa S, Srinath S, Vishwanath SK, Bhardwaj P, Singh R. Evaluation of facial image scale and Venham picture test used to assess dental anxiety in children. JIAPHD 2013;11:31-5. Ikusaka M, Kamegai M, Sunaga T, Narita N, Kobayashi H, Yonenami K, et al. Patients' attitude toward consultations by a physician without a white coat in Japan. Intern Med 1999;38:533-6. McCarthy JJ, McCarthy MC, Eilert RE. Children's and parents' visual perception of physicians. Clin Pediatr (Phila) 1999;38:145-52. Rehman SU, Nietert PJ, Cope DW, Kilpatrick AO. What to wear today? Effect of doctor's attire on the trust and confidence of patients. Am J Med 2005;118:1279-86.